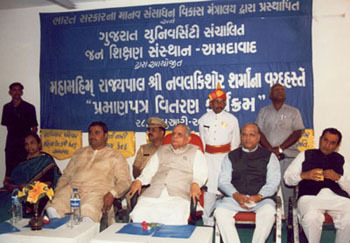 Jan Shikshan Sansthan, Ahmedabad was established in 1975-76. It was the second oldest institutions among all the Jan Shikshan Sansthan in India. The first Shramik Vidyapith was established in Mumbai in 1965. Since 1976 Shramik Vidyapith, Ahmedabad (Now onward 2000 Jan Shikshan Sansthan) is working under the aegis of Gujart University. The chairman of this institution is the Hon. Vice-Chancellor of Gujarat University. The population explosion, industrial development and migration of people from rural to urban areas have resulted in the very fast growth of the urban sector in the country. Rapid urbanization has created many socio-economic problems making life miserable, particularly for migrants and deprived communities who normally live in inhuman conditions in the slums, on pavements, in settlement colonies, labour colonies etc. Many are first generation migrants exposed to the stark realities of complex urban life and the industrial milieu. Similar conditions affect people living in the peripheral rural areas who have links with the neighbouring urban agglomerations for employment, business, services etc. Lack of education and skills - both vocational and technical, have left migrants unemployed/under-employed. Even those who have got jobs in factories/industries/ business establishments receive a meagre sum as wage/salary and hence, they are frequently unable to make both ends meet. Many, particularly youth, have fallen prey to anti-social elements. An urgent need therefore exists for specialised education integrated with awareness and functional improvement for such people. Adult education is vitally important for these groups to improve their lives, decrease their dependency, increase their work efficiency and sharpen their capabilities for adaptation to social, economic and technological changes in the midst of their lives and work. The educational and vocational needs of these deprived sections constitute a specialised area of continuing education demanding its own strategy, institutional arrangements and techniques. Relating this need and growing urbanization to the coming decades, the then Ministry of Education and Culture, Government of India, started a scheme of Shramik Vidyapeeths - a programme of Adult Education for Workers in Urban and Industrial areas. In the context of the country's overall development, this programme was conceived as responding to the educational and vocational training needs of numerous groups of adults and young people. Men and women belonging mostly to the unorganized, urban informal sector, living and working in urban and industrial areas and persons who have been migrating from rural to urban settings, were expected to derive substantial benefits from such a scheme. The first Shramik Vidyapeeth was established in Mumbai (Worli) in the year 1967 and gradually the number increased to 17 up to 1983, to 40 in 1986 and to 58 by the end of VIII Five Year Plan i.e. 1996-97. These institutions have already proved to be one of the best vocational adult education centers in the country and the courses offered by these institutions are in popular demand. Today, SVPs offer around 225 different types of vocational training programmes ranging from candle and agarbatti making to computers. None of the existing organisational structures is in itself against the interests of the scheme of Shramik Vidyapeeths. Shramik Vidyapeeths can function effectively as autonomous, non-autonomous or semi-autonomous institutions. Keeping in view the findings of the evaluation, Shramik Vidyapeeths have been strengthened with enhanced annual grants. Mass Campaigns for literacy in India have been essentially campaigns for social mobilization for awakening and arousing people in all walks of life. As people's participation in Literacy Campaigns begin to increase, their involvement in socio-economic activities also becomes more meaningful. More than 85% of the country has been covered by the Literacy Campaigns and over 150 million learners in 9-25 age group, of whom about 62% are women have been brought within its ambit. 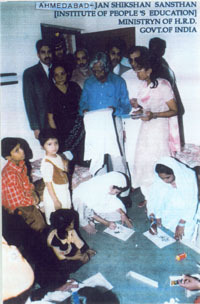 Literacy has become a significant instrument of empowerment for the poor, neo-literates and oppressed groups. 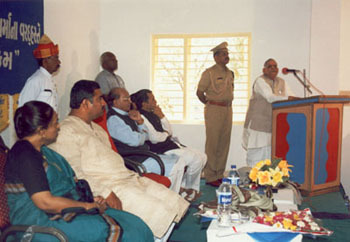 Hitherto, the scheme of Shramik Vidyapeeths was restricted to urban/semi-urban industrial areas. Keeping in view the changing literacy scenario in the country and the large number of neo-literates to be covered under Continuing Education [in which skill development/ up gradation is a part], the activities of Shramik Vidyapeeths are proposed to be enlarged to provide academic and technical resource support to Zilla Saksharata Samities [District Literacy Committees] in taking up vocational and skill development programmes for neo-literates in both urban and rural areas and also to organize equivalency programmes through Open Learning Systems. To facilitate the playing of a better role, the institutions will now be renamed as Jan Shikshan Sansthan (JSS) - Institute of People's Education (IPE). Jan Shikshan Sansthan (JSS) is conceived as an institute for conducting skill up gradation in the areas of programmes of Non-formal, Adult and Continuing Education. It would also provide academic and technical resource support to Zilla Saksharata Samitis in both urban and rural areas. To organize equivalency programmes through Open Learning Systems. To widen the range of knowledge and understanding of the social, economic and political systems in order to create a critical awareness about the enviroment. To promote national goals such as secularism, national integration, population and development women's equality protection and conservation of enviroment etc. A remarkable Working method in Educational Field: Anyone from society can join the institute of peoples' education. There is no barrier/ difference whether the person is of any caste, creed, age, educated, poor or rich. Everyone has the right to get training in this one and only institution. Because of informal method to be followed by the said institution it has its different individuality compared to other institutions working on the same lines. Training classes are classified according to the needs of the trainee groups. Need based programme is organized according to the demands of the, trainees. The training classes, place and timings is arranged as convenient to the trainees. The training hours are 1 to 2 hours. After surveying economical conditions of the trainee groups the fees are fixed up e.g. those who are staying in huts will have to pay Rs. One as a token fee for per day their training and this minimum fee is for the whole syllabus; where as middle class and rich group will have to pay more for the same syllabus. According to the educational qualification of the group the medium of instruction is decided for instructions to be given in Hindi or Gujarati. At the training classes theory and practical training is given. If a person, is a just newly trained person, he will get more practical training rather the emphasis is given to practical training. In any field, if there are 1 5 to 20 trainees and provided there are preliminary facilities for the training, then immediately the class will start. 70% presence is a must for every trainee and those who have fulfilled these norms will get a certificate from the "Institute of Peoples' Education" from Gujarat University. Educational qualification is expected according to the subject. Permission for training class is given to social voluntary institutions, youngsters group, industrial units or the union according to their demand. Nearly, more than 150 voluntary educational institutions have been affiliated with this project. Any institution, with the Co-operation of, can be part and parcel of these training classes and after surveying these training groups the selection of class room and basic facilities including expenses incurred for training class is given. To conduct this type of classes, help is given to encourage project. "Institute of peoples' education" is giving training in Vocational study with nearly 200 subjects. According to the need and demand of the trainee groups, training class is organized in the institutions premises. Those Trainees, who have no information or know how in respect of new art and the new subjects, this type of training class is known as skilled information. When some one is trained or has mastered the art, but if he is modern in his approach, then it will promote something new in the syllabus and that very thing will help in the development in his mastery. Training with such syllabus is known as skill up gradation training. E.g. one trainee just knows simple stitching work but if he is not well versed with fashionable Punjabi suit and is not able to design the latest dresses, in order to get mastery over it, he must equip himself with new stitching style. For these types of people there are special training classes to overcome their weaknesses. Unconstitutional education system being non-formal education, syllabus is formed according to the need and demand of trainees group, besides educational qualification is also considered in this respect. Newly literates (Adult Education) are getting practical training according to their demands. Syllabus is not moulded in the typical pattern. Those Children, who have left their courses in-between, are given equivalent education and are made eligible for the national school for their examination and through this an encouragement programme is arranged. In this type of training programme, education is given by experts in various subjects. Those students, who have developed bad habits, over a period, are made aware of importance of Values- such as Joint family, social, customs, etc. Due to which, they are convinced about- how to save money by not spending money after bad habits, to keep away from addiction and intoxicating drugs, to give knowledge through discussion on health subject, first aid, importance of co-operative society, national integration and unity between communities, heritage of our culture, importance of our religious and national festivals. Motive behind this type of lecture is to train them for better living. Main objective is to give them knowledge to change their life style for the betterment. Along with vocational training a trainee can have his own profession. He can have industrial work of his own choice and can start Cottage Industry. How one can learn through learning at home, marketing, and knowledge regarding selling and how one can collect wholesale goods? Information pertaining to all these things training is given through this scheme. Radio & T.V repairing, assembling. Refrigeration & Air conditioning & repairing.